Fullerite is the solid-state manifestation of fullerene molecules and can be found naturally occurring within interstellar gas clouds. Fullerites are coveted for the unique structural properties that make them some of the most useful materials known to humankind. Fullerene-based technology has applications in electronics, propulsion and engineering as well as the construction of ultra-hard metal alloys and heat-resistant weapons systems. Because of the near-identical processes involved in crystal formation, fullerite clouds are acquired using the same, pre-existing gas harvester technology that has supplied booster manufacturers with their own cloud materials. Sleeper NPCs take a little while to spawn in to ladar sites. 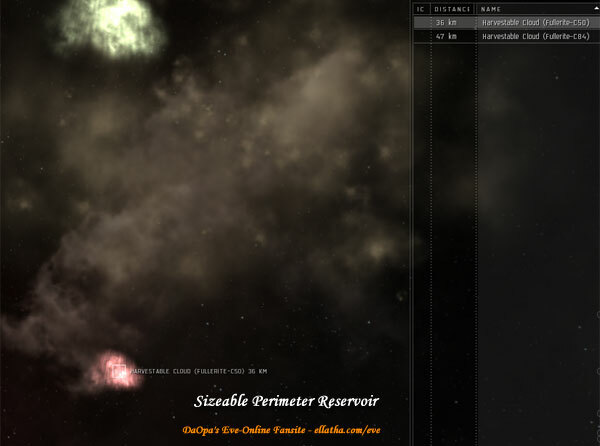 Using a capital ship on these sites does NOT spawn additional npc ships. Despawns within one hour of being completely drained.